Do you find that if you set out to learn something, it often doesn’t work, and you end up learning something else way more interesting? I do! 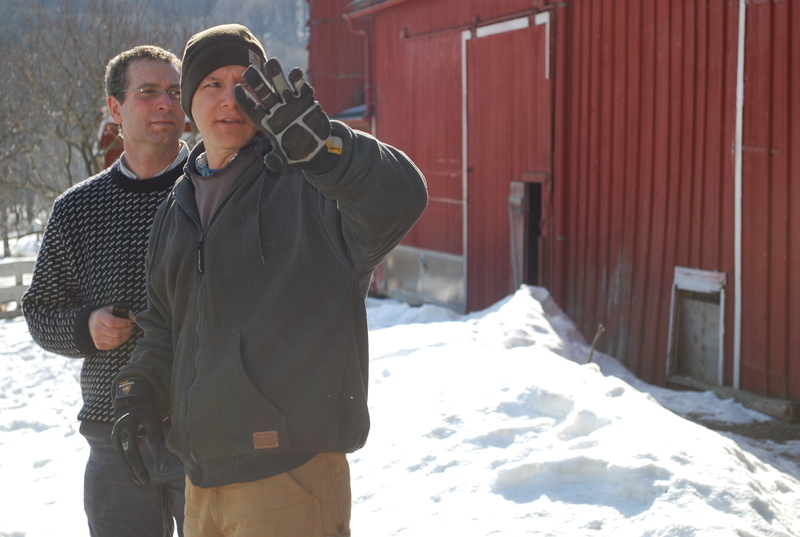 David and I set out to visit some of his farming mentors in March of 2011. We drove to Massachusetts where David learned to farm. One of our first stops was to visit Dan Kaplan, who runs Brookfield Farm. Dan is a wonderful farm mentor to many new farmers. He has a relaxed but intense energy and he really seems to have the training of new farmers worked out. He has his farm and programs so well organized that he can take a 2-week vacation with his family in the middle of the summer. 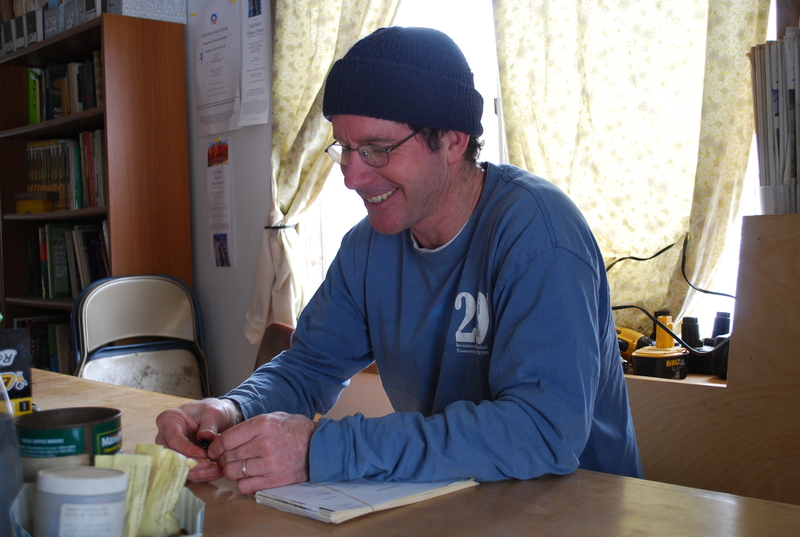 Dan said that as far as he knows, he was the first CSA vegetetable farmer to come up with the idea of organizing his planting and fieldwork schedules on spreadsheets. Besides making the summer vacation possible, Dan’s efficiency and organizational skills allow him to keep his work hours under control. The Brookfield farm crew works five and a half days a week Monday through Friday from 6am to 5pm and Saturday mornings. Dan is careful to start and end the workday on time except for the most dire emergencies. From what we could gather, emergencies are very, very rare on this landmark farm. After talking with Dan, we set out to explore the farm. David was very interested in Dan’s selection of tractors, and of course, we paused to check out the root crop washer. 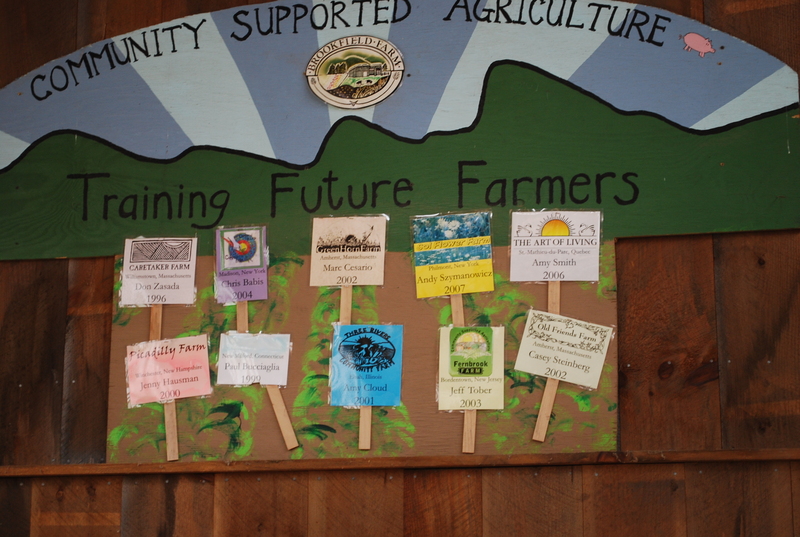 Then we saw a display on the wall of the distribution barn where Dan’s apprentices, and the farms they run, are posted. It is quite something to see all those names, including Don Zasada of Caretaker Farm, Casey Steinberg of Old Friends Farm, and Amy Smith of the Art of Living Farm in Quebec. 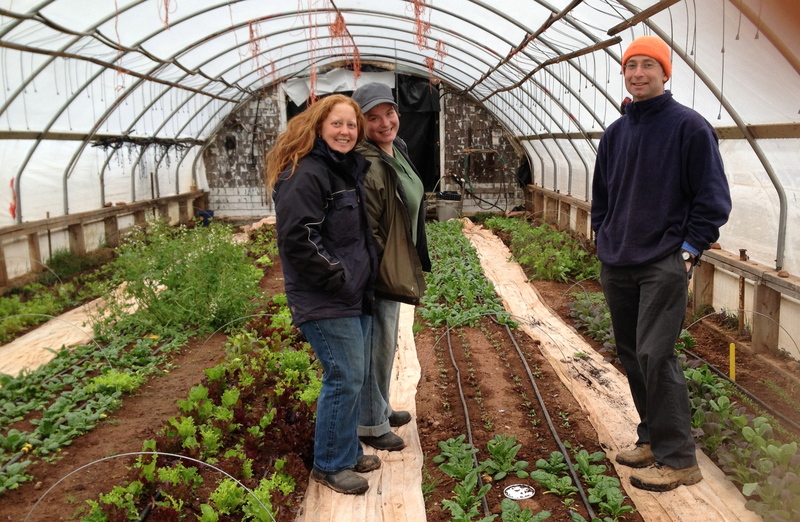 Amy is now running Heartbeet Organics with her partner Verena in PEI. More on that later. 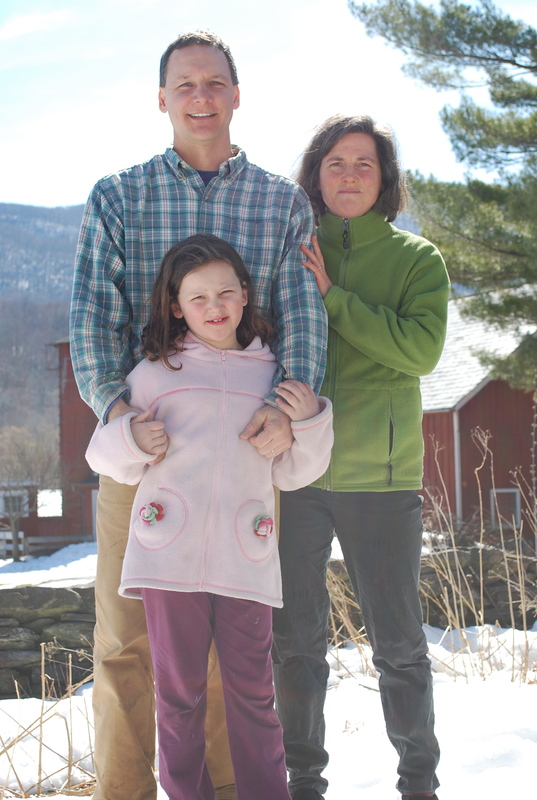 The following day, we went to visit Casey Steinberg and Missy Bahret at Old Friends Farm in Amherst MA. This is where we encountered GINGER! Missy was growing and selling young ginger root. She’d done growing trials and had it figured out. Now she is growing close to half an acre of ginger in a Haygrove tunnel greenhouse. She told us enough so that we could get started too, and a number of her farming friends in the Northeast US are now growing it. 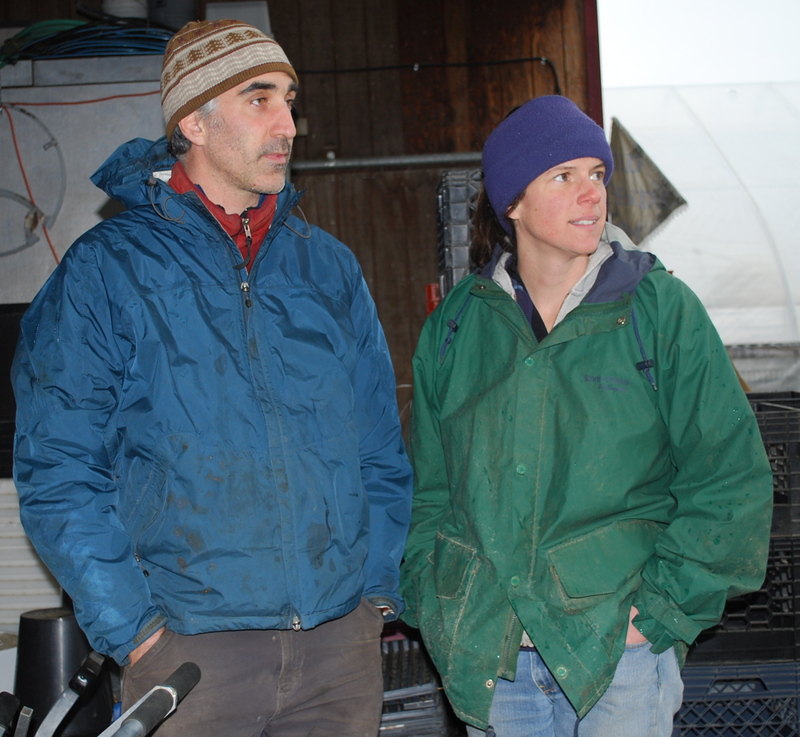 Our next stop was further West to see Don Zasada and Bridget Spann of Caretaker Farm in Williamstown, MA. David had worked with Don at The Food Project outside Boston in the 1990s. He said Don is the master of organization, spreadsheets, and boundaries. David and I were all excited to share the ginger growing idea from Missy and I could see Don’s wife Bridget was interested. Immediately Don said “No, we can’t take that on. We have enough to do, I don’t want any new projects cutting into my family time.” See? Good boundaries. Like Dan Kaplan, Don Zasada takes a mid-summer vacation and so do his apprentices. That is unheard of! I think these farmers were showing us how important it is to take breaks and have defined work hours. It is so easy as a farmer to just work ALL the time, and burn out. We really admired Don’s streamlined, keep-it-simple style. A great example of this is his vegetable washing and packing area. 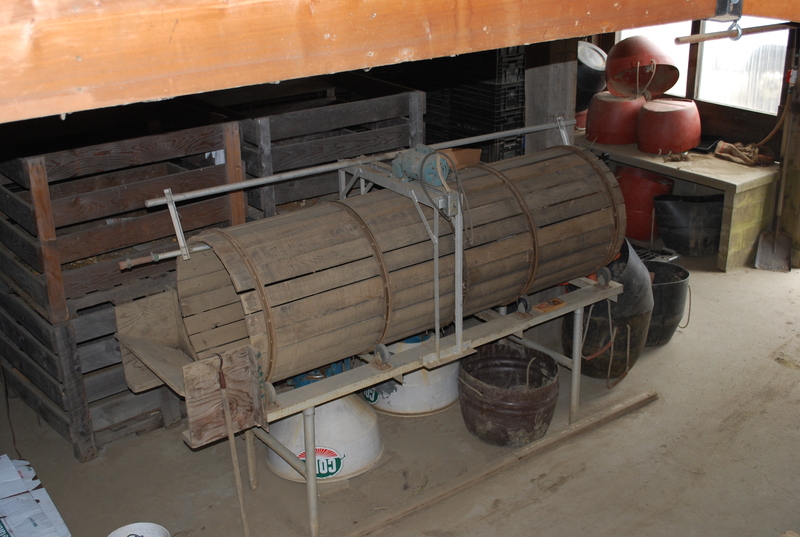 Even though they have 265 families in their CSA, the wash station was nothing more than a mesh table, a small counter and a bath tub mounted on a stand leaning up against the side of their barn. I have seen farms that produce half as much food with fifty thousand dollar packing houses! Back at home in Nova Scotia we planted a few ginger rhizomes in our little seedling greenhouse and they grew to yield rhizomes of their own. We ate them, loved them, and then thought we’d plant a commercial crop the following spring (2012). 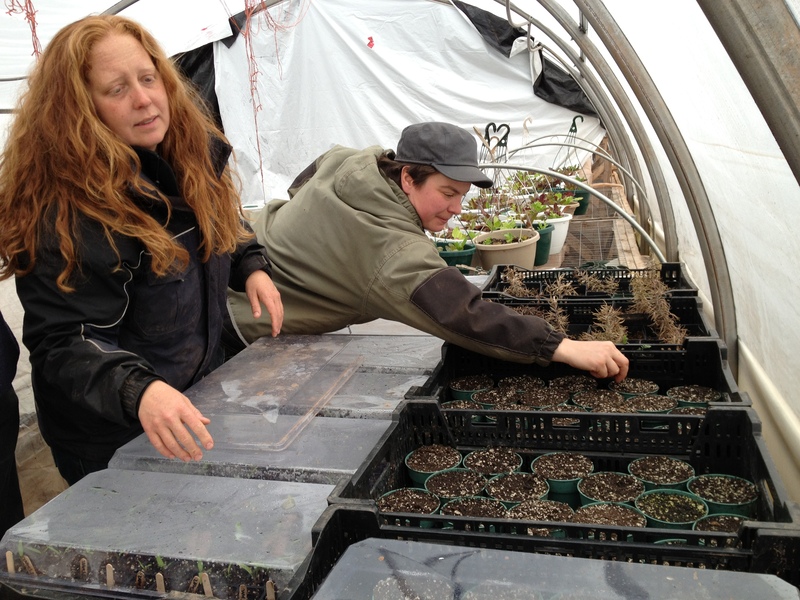 That spring we met Amy Smith and her partner Verena Varga of Heartbeet Organics. We were all at a greenhouse conference organized by ACORN. Amy is another one of Dan Kaplan’s apprentices. We noticed her at the conference and thought she was particularly sharp (the smart kind of sharp not the grumpy kind of sharp). When we learned she’d apprenticed at Brookfield Farm with Dan, it all made sense. After talking with them, Amy and Verena decided to plant some ginger that spring too. Ginger rhizomes started in pots. Later they moved them on to heat mats, which helped sprout them. They have a lovely farm in PEI so we had to visit them in April. Their ginger turned out well and they are growing it again this year (2013). Even though we made a few mistakes with our 2012 crop, we were thrilled with the harvest and are greatly expanding our plantings for this coming year (2013). 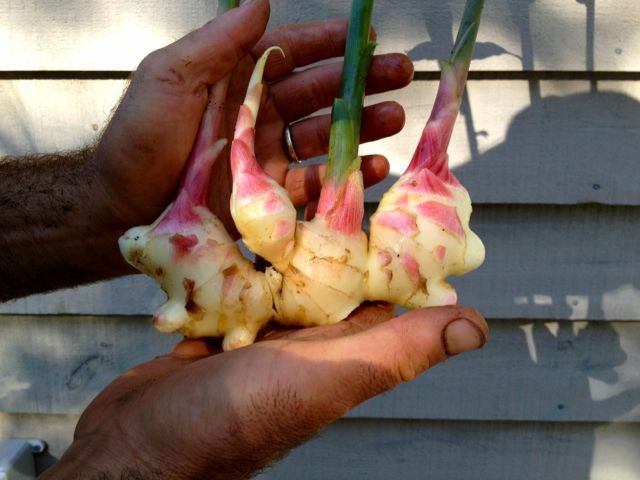 By next fall, we should know enough about ginger to share some solid growing information. On the one hand, why import ginger if we can grow it here? And it is so fragrant, hot, and yummy! On the other hand, I wonder if we are being unwise to grow it because we have plenty to do. Our boundaries and production systems are not well developed enough to have a vacation this summer like Dan and Don. But now that we have been shown what is possible, we have a goal to work towards. 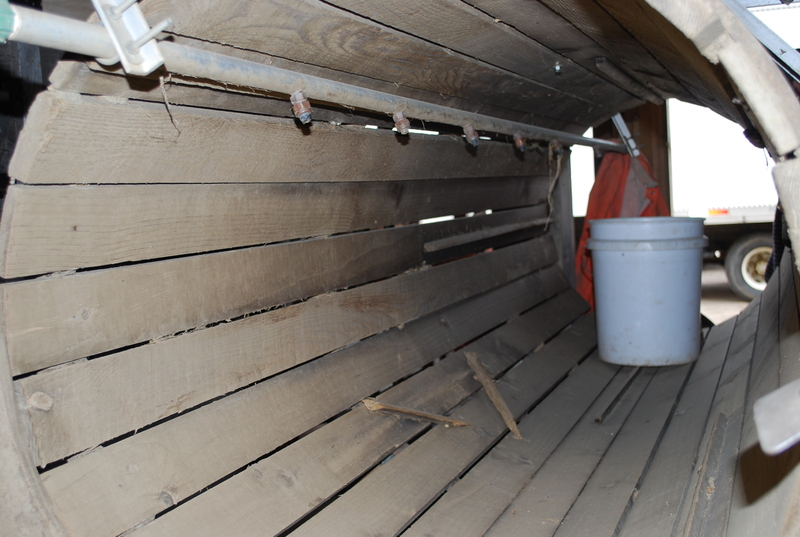 This entry was posted in farm mentors, season extension and tagged farm apprentice, farm burn-out, ginger. Bookmark the permalink.